Yesterday I showed you the new Mountain Dew flavors. The grocery shopping trip where I bought those was limited edition soda heavy as I also found American Idol Coke. The end cap of the supermarket aisle had a bin full of little round bottles of Coca-Cola. It’s a given that I am a sucker for such marketing gimmicks and of course I plopped a bottle of the soda into the cart without a second thought. Seems to be that all soda companies are introducing new flavors or re-vamping old ones in attempts to keep your dollars in their pockets. However, Coke just cannot do that. Sure, they can add lime/vanilla/lemon/cherry and whatever to the original formula. Die hard coke fans aren’t going to buy these varieties. The beverage giant has been left with no other option than to simply change the shape of the drink’s container. The cost: one dollar. One dollar of round soda fun. 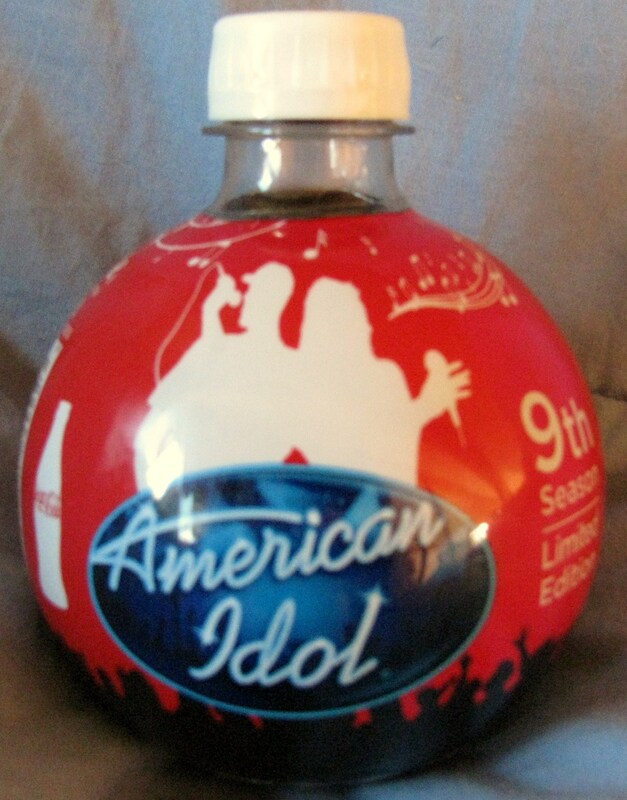 This is a special edition American Idol 9th Season bottle, being that if you drink enough of them you turn into Ryan Seacrest. Of course I went home and wasted some brain cells on researching the origin of the bottle. Were there actually more season’s with their own special bottles? Why is it round? I wanted to get the facts out there. Turns out I found that seasons one through three had their own glass bottles. I could not find any bottles meant to commemorate season’s four through eight. 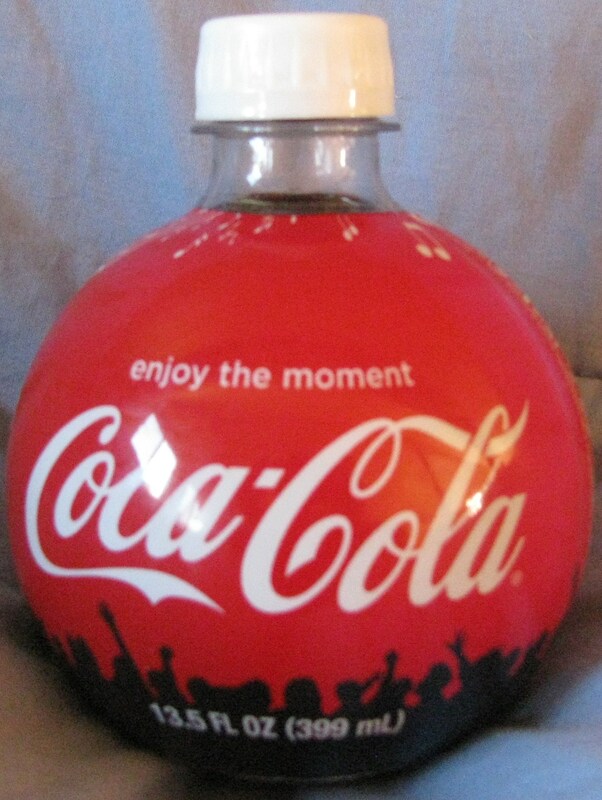 Why now, at season nine did they decide to push singing soda bottles once again? WHY are they round? A short search for round coke bottles gave me a hypothesis. 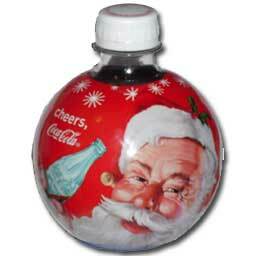 Apparently last Christmas Coke dressed up the little orbs with St. Nick. If I had seen them at the time, I would have consumed the soda, tied a string to the neck of the bottle and slapped it on the tree next to The Max’s macaroni and magic marker ornaments. My guess is they either had left over bottles or simply wanted to use the unique mold once again. I feel I’ve solved a mystery. I feel like Nancy Drew. I’ve never read a Nancy Drew book in my life, but I imagine she felt as satisfied as I do at this moment. As for American Idol, I don’t watch it. Certainly not because I am too good for overnight singing sensations . Television reception is non-existent on the mountain. Tell me who wins. This entry was posted in Blogroll and tagged American Idol, Beverages, Christmas, coke, Mysteries. Bookmark the permalink. No Nancy Drew? Ever? Okay, has Rachel ever read a Nancy Drew book? She looks like the reader. Sooo off topic. Sorry. You are, of course, spot on. That’s because, as the oldest, I’m the Rachel. I linked your blog post to my blog today. I’m part of a meme that posts alphabetical foods on Mondays. Today I did R- hence, round Coke. Hope you don’t mind me shooting some readers your way. I know I’m late to the party here, but just wanted to say I got one of those Christmas ornament bottles this past Christmas. I’ve still got it. I was going to hang it off my tree, but if you remember how small my tree is, I ended up just sitting it on the table next to it. It literally would have toppled the tree over with its weight. And yeah, I think they basically just recycled the bottles from that because they had so many. They’ve actually been making them in that shape for a couple of years now. why are they taking the orbs of the floor at walmart this morning . they were just put out. i snatched one with a polar bear on it and bought it before the forklift took off???? ?